The number of patients who died in the hospital decreased 8% in 10 years, as did the rate of hospitalizations ending in death, the Centers for Disease Control and Prevention reported. The 8% decrease is a fall from 776,000 in 2000 to 715,000 in 2010, while the number of total hospitalizations increased 11%. Among the 715,000 patients who died in the hospital in 2010, one-quarter were ages 85 and over. Patients who died in the hospital had longer average hospital stays than all patients. The CDC report is derived from National Hospital Discharge Survey (NHDS) data. Also, death rates fell for all first listed diagnoses except septicemia, which rose 17%. Death rates fell for respiratory failure by 35%, for pneumonitis due to solids and liquids by 22%, for kidney disease by 65%, for cancer by 46%, for stroke by 27%, for pneumonia by 33%, and for heart disease by 16%. 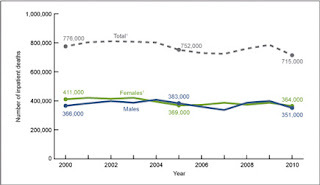 --Female inpatient hospital deaths decreased from 411,000 in 2000 to 364,000 in 2010. 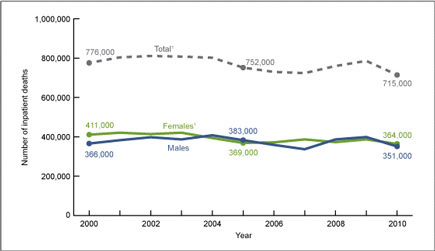 Male inpatient deaths did not change significantly during this time. --In 2000, 2005, and 2010, about 75% of the inpatients who died in the hospital were aged 65 and over (Figure 2). --The percentage of hospital deaths for those under age 65 increased 9%, from 24% in 2000 to 27% in 2010, while the proportion of inpatient hospital deaths for those aged 65 and over decreased 3%, from 76% in 2000 to 73% in 2010. --The average age of patients who died during their hospital stay was 72–73 years throughout the period from 2000 to 2010.